This audio was first aired on the November 28, 2014 edition of The Daily GRRR! The clip that kicked off the show is from Mumia Abu-Jamal with his piece entitled Ferguson. Check http://prisonradio.org for more of Mumia's podcasts. As one of hundreds of actions taking place this week around the world in solidarity with the protests in Ferguson, Missouri, over 100 people gathered the evening of November 27 at City Hall in Kitchener before marching to the Waterloo regional courthouse. Chanting among other things #HandsUpDontShoot, "Racist Police -- Off Our Streets!" and "The system isn't broken, it was built this way" the demo included a cold 4.5 minute die-in in the waterlogged concourse in front of the courthouse, representing the 4.5 hours Michael Brown lay dead in the streets after being executed by officer Darren Wilson. Stay tuned in after the break for more on the #KW2Ferguson mobilisation. 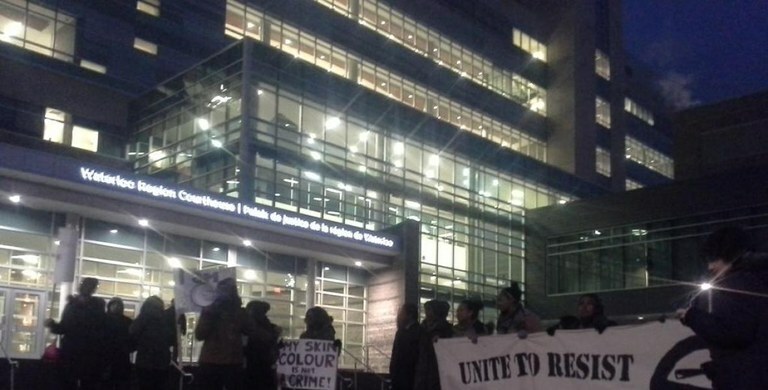 Part 1 of today's two-ppart feature is an interview with Melissa Falconer from the Association of Black Students at Wilfrid Laurier University in Waterloo, an organizer of the #KW2Ferguson demo which took place in the evening of November 27. The demo was one of hundreds across the continent in the past week and included a 4.5 minute die-in in front of the Waterloo regional courthouse to represent the 4.5 hours Michael Brown laid in the street after being murdered by police officer Darren Wilson. Part 2 is a read of the Facts and Demands in the September 24, 2014 police involved murder of Jermaine Carby, an unarmed black man from Burlington, Ontario. The SIU continues to deny information to the family of the man who was seemingly murdered by the Peel Regional Police.